How to Get Verified on Instagram in 2019. Instagram is now offering details about what it takes to get that blue badge. It's also allowing users to request verification themselves. Here's how to do it and why getting verified is worth your time. Before, Instagram was pretty much a black box in terms of who got the blue check. Some popular accounts and celebrities got it, others didn’t, and no one knew why. Luckily for Instagrammers everywhere, since August 28, 2018, users have been able to request verification from Instagram directly. We’re going to walk you how to apply for that beautiful blue badge in just a few easy steps. Also see: How to Create the Perfect Professional Instagram Bio, plus 5 Instagram Advertising Mistakes You’re Probably Making. It’s actually very simple to request Instagram verification. Before following the instructions below, though, make sure you’re logged into the account you want to get verified. For example, if you want to get the Instagram badge for your company account, be sure you’re not in your personal account on accident. 1. Go to your Instagram profile by tapping the icon with your profile picture in the bottom-right corner. 2. Tap on the menu icon ( ) in the top-right corner of your profile. 3. Select the settings icon ( ) that appears at the bottom-right of your screen, then select Account from the settings menu. 4. Scroll down through the account settings until you see Request verification, then tap it. 5. A form will appear with your account name pre-filled. First, add your full name (for businesses, the full name of whoever manages your Instagram will do). 6. Next, tap Choose File to attach a photo of your ID. For a person, a driver’s license, passport, or national identification card will work. For a business, you can use any official business document such as a tax filing, article of incorporation, or even a recent electrical bill. 7. Either open your camera and take a clear, in-focus photo of your ID or upload an image of your ID from your phone. 8. Finally, tap the blue Send button at the bottom of the screen to submit your verification request to Instagram. What happens now? Am I verified? Hold on just a second—you’re not a verified Instagram celebrity yet. Your request will now go to individual moderators at IG who will review your account and decide whether or not to approve you for an Instagram badge. This could take several weeks, so it’s not a bad sign if you don’t hear back straight away. Once the Instagram authorities have made their decision, you’ll receive a notification in the app telling you whether or not you are Instagram verified. If your request is denied, don’t lose hope! You can submit a new request after 30 days. Most verified accounts on Instagram are well-known brands or public figures with high follower counts. But you don’t need tons of followers to get verified – you just need to be an account that’s likely to be impersonated. After releasing the option to request verification on August 28, Instagram is now being more transparent about what it takes to get a verified badge. They now publicly state their standards and requirements for getting verified on Instagram on their help center. Be notable. Random people can’t just get the blue Instagram badge by asking nicely. You or your brand must be featured in multiple news sources, be highly searched for, and be well known to the general public. Being featured in paid or promotional content doesn’t count. Only request verification for one account. According to Instagram, your account needs to be “the unique presence of the person or business it represents.” You can’t have multiple verified accounts for yourself or your brand, basically. The only exception is for language-specific accounts (like McDonald’s Denmark vs McDonald’s Italy, for example). Finish setting up your profile. You can’t get verified on Instagram if your account doesn’t have a bio, a profile picture, and at least one post. Don’t lie. If you provide “false or misleading information” when applying for verification, you will have your verified badge removed and face possible suspension or even a permanent ban from Instagram. Once your account is verified, you’ll automatically rank at the top of relevant Instagram searches. For many people, getting the Instagram check is just a badge of honor. It looks cool, it builds your clout, and it makes you feel important. But those aren’t the only reasons requesting Instagram verification is worth your while. 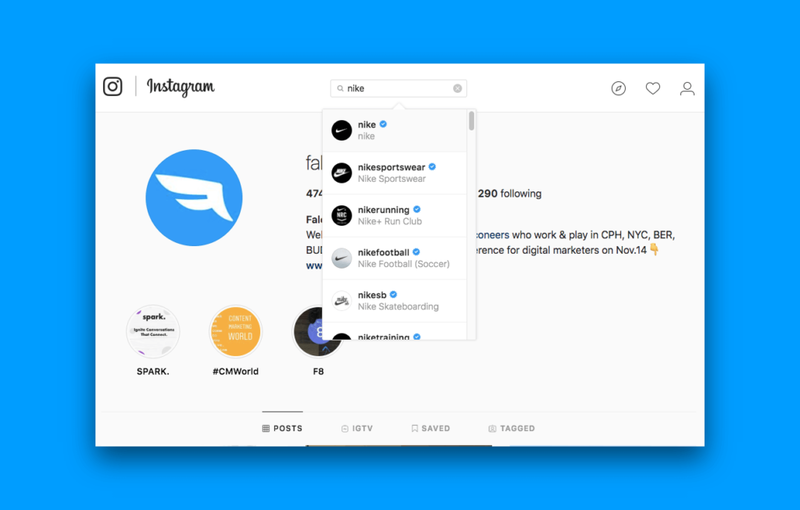 You prevent copycats and imposters: One of the best things about getting the blue Instagram badge is that anyone searching for you or your brand will immediately see that you’re the real one, making sure that you don’t lose any potential followers to fan accounts, parody accounts, or imitators. You prove that you’re newsworthy: Getting Instagram verified proves that you’ve appeared in several independent news sources and that you or your organization are so notable that people want to copy you—and as they say, imitation is the sincerest form of flattery. While it may just be the opinion of the Instagram moderators, this still shows your present and future followers that you’re considered a publicly-known figure or brand. It’s great for Instagram SEO: If you want your account to rank at the top of the Instagram search results for terms relating to your account name, getting the blue check means an automatic win. Verified accounts always rank above non-verified accounts for the same Instagram search—so that’s just icing on the cake. Okay, now we’ve hyped up how great having the Instagram badge is—but what if you’ve requested verification several times and for whatever reason, the Instagram moderators just don’t think your account merits a blue check? On the one hand, you can always wait until you/your brand become more newsworthy and you’re starting to have fan pages and copycat accounts pop up. In that case, you can always request verification from Instagram again as long as it’s been at least 30 days since your last request. However, keep in mind that paid or promotional articles and news coverage will not count towards your account being considered newsworthy. On the other hand, the main point of Instagram verification is to prove that your account is authentic and to tell potential followers that yes, it’s really you. In that case, there are other measures you can take to prove you’re legit. First, you can link to your Instagram account on your company website and in your email signature. Second, you can also link to your IG profile from your other social media accounts like Facebook or Twitter. Both of these methods mean anyone clicking that link to your Instagram profile will know it’s really you. Adding a link to your official Instagram account on your website is a great way to make sure potential followers know it’s really you. Finally, you should keep your account consistent by maintaining a similar tone in your writing and keeping the aesthetic of your posts on-brand. Easy ways of branding your IG account include starting new hashtags related to you or your products and repeatedly using the same filter on each image post. When combined, all these techniques will show potential followers that your account is authentic—even if you don’t have some fancy blue check. How else can you get more followers on Instagram? While a lot of the Instagram accounts with the most followers are verified, you don’t need an Instagram badge to build a large and devoted follower base. All you need to do is make engaging posts, post them at the right times, and build a community around your brand. To improve your post engagement on Instagram, we recommend these 21 Tips to Massively Increase Instagram Engagement. To find the optimal posting times for your content, you need to understand the 2018 Instagram Algorithm Change, which prioritizes newer posts. You should also look at analytics about your audience’s peak times, but if you don’t have that data available we recommend these Best Times to Post on Social Media as a starting point. Lastly, you want your followers to feel like they’re part of a community, not just passive content consumers. Reply to their comments, ask them questions, or even consider starting contests based on user-generated content. For inspiration, check out these 5 Brands That Built Authentic Social Media Communities.